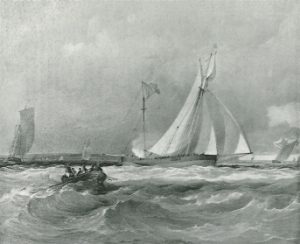 ‘Alarm’ winning the Ladies’ Challenge Cup at Cowes, August, 1830. Chapter 3 tracks the development of yachting as the direct influence of the Dutch faded following the Restoration. It continued to be a time of war but ‘yachts’ developed into the familiar ketch format with large sail areas. By the end of the C18, the announcement of a regatta on the Thames in 1775 was something of a milestone in leisure yachting. The emergence of what was to become the Royal Yacht Squadron also led to a new form of organisation.